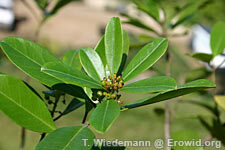 Ilex paraguariensis is a small S. American tree that's leaves contain caffeine and other xanthines. The toasted leaves have a long history of use as a stimulant tea. Falsely rumored to contain a unique chemical mateine. Does Yerba Mate Contain Caffeine or Mateine?